Kicking off Winter Eternal, Exile The Traitor make sure that listeners know they mean business from the beginning. Laments Of A Flesh Peddler opens up with an imperial and confident overtone, belying the band’s short existence. Switching between modern grooves, blasts, and d-beats, the drums – which can be a background feature in extreme music – are instantly noticeable, as is the intelligent use of alternating death and black metal vocals. Actually, every member seems to get their breathing space, which is something I’ve always enjoyed in extreme music. The following numbers are no disappointment, either. This is the same ETT who grabbed the Scottish metal scene by the neck when they unleashed Necrology in 2012, but they are testing the waters of maturity already, and taking some chances in an environment which can be quite unforgiving. The original brutality is still consistent throughout, but there are fresh twists and turns brought into play here. Organic tremolo riffing, akin to that of Gojira in its memorability, stands shoulder to shoulder with the Swedish influenced death metal for which they are already known. The shadow of At The Gates has long been one to haunt many, many bands who have sprung into existence in the last decade, and in a lot of cases (quite often justifiably) it has been drawn up as a negative. ETT are no carbon copy, though, pulling on numerous other wells to deliver a professional, bruising, original musical identity. That said, the reference is strong, and if you’re fully against that sort of thing, this probably won’t be for you, but I would suggest clearing the mind and giving it a shot, anyway. The sum total of Winter Eternal far surpasses what one might expect of a band who are only at the stage of putting out their second EP (or demo, as we used to call them), and it’s terrifying to consider what Exile The Traitor could become with the right support behind them. There’s still some growing room in there, but if this is the direction they continue to spread their wings, it’ll be no bad thing. 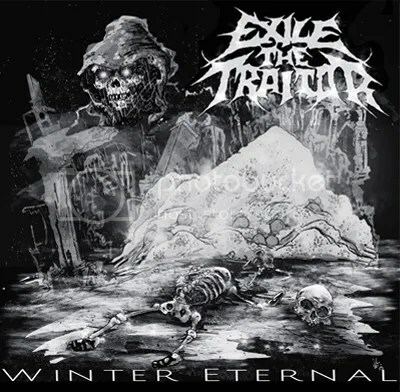 This entry was posted on 3rd May 2015 at 5:58 pm and is filed under CD, Metal with tags EET, exile the traitor, melodeath, Melodic death metal, self release, winter eternal. You can follow any responses to this entry through the RSS 2.0 feed. You can leave a response, or trackback from your own site.